I may like charts too much. 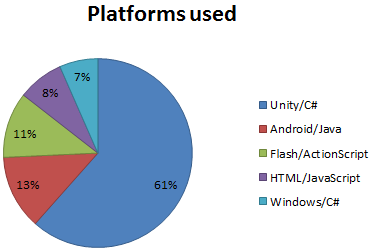 This was initially created mostly to illustrate the fact that the fall in popularity of Flash and ActionScript wasn’t a surprising event – technologies constantly come and go – but when I saw the result, I was still surprised at the number of platforms I’ve actually worked with in the past, and forgotten or abandoned. Admittedly, however, the way I gathered the data for the chart wasn’t very scientific: I’d look at the projects I had worked in a given year, and fill the numbers with whatever percentage of my attention I thought I had given to each platform. Starting with 2013, I decided to collect that data monthly, to try and make it a little bit more accurate. However, my approach for data collection didn’t change much; I was still mostly estimating the amount of time I had dedicated to each platform. Every time I’d show my data to someone, people would ask me what I was using as a unit (was it time? lines of code? commits?). This led me to decide to make things a bit more accurate for 2014. Call it a New Year’s resolution, I suppose. So for 2014, I wanted to have a way for measuring where I spent my time more accurately by measuring the application I’m running at any given time, and what kind of file I’m editing with it. Surprisingly, there are a few services that already do something like that – e.g., RescueTime – but none with the level of granularity and simplicity I wanted. I’ve been running it for a few weeks and now I consider it solid enough for daily use. I have it running on both my work and home computers, saving separate log files that can be analyzed later. The application is available as an open source project on GitHub under the WTFPL license. A pre-compiled executable is also available, although it has no installation file (just copy it to where you want to run it from). And while it just generates a raw log that requires analyzing later, I’ve been working on a simple, standalone HTML page that does the trick (not very configurable yet, though).